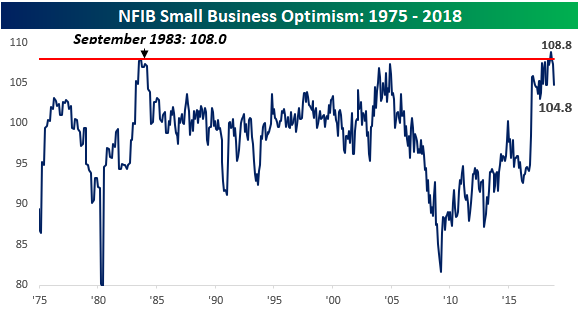 Small business optimism showed a meaningful pullback in November on both an absolute basis and relative to expectations. While economists were forecasting the headline index to come in at a level of 107.0, the actual reading was 2.2 points lower, making it the weakest report relative to expectations since April and the largest m/m decline since March. 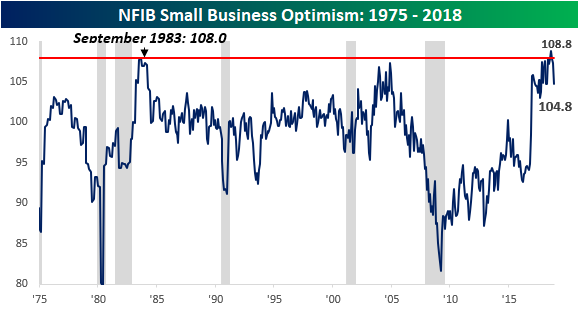 After hitting record high levels back in August, the NFIB Small Business Optimism Index has now seen three straight monthly declines, and like a few other indicators, it’s showing signs of rolling over. With that, we’ve heard and read a number of comments suggesting that this decline is another signal that the business cycle may be turning. Sign up today for our 2019 Annual Outlook Special to receive access to our section on “Economic Cycles” and find out!